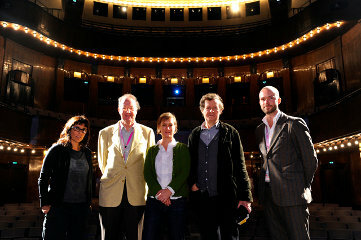 On a wintery Sunday morning, in the hundred-year old HAU1 theatre in Berlin, British screenwriter Sir David Hare is in conversation with Brazilian writer/director Daniela Thomas (Foreign Land), US producer Anne Carey (The Savages, Thumbsucker) and British film critic Peter Cowie. He’s talking about working with director Stephen Daldry and editor Claire Simpson on The Reader, screening in the Berlinale’s competition section and the reason he is in Berlin. More generally, he’s talking about his belief that screenwriters and editors should be involved, like directors, “from beginning to end” of a film production. The theatre’s mahogany stalls hold an audience of filmmakers from around the world, attentive, if perhaps a little sleep-deprived from the previous night’s opening festivities. They are here for the Talent Campus, the Berlinale’s program for “up-and-coming” filmmakers, or, as the program rather sweetly calls them, “Talents”. The event is now in its 7th edition. In 2003, its first year, I also attended as a “Talent”. Finding myself again in Berlin in 2009, I’ve returned as a member of the press to see if the optimism, energy and excitement it inspired then is still the same. This year 347 young and emerging film professionals, selected from some 3800 applicants, have come from 103 countries to the Hebbel Am Ufer theatres (HAU1, HAU2 and HAU3) and the Berlinale to attend masterclasses with experts, see the European Film Market in action, consolidate skills, watch films and, importantly, meet each other. It is all about the personal relationships… That’s all you can say. You just have to make films with people you trust because legally and morally and in every possible way you are in an inferior position. As with the Talents, Hare and his colleagues on stage have an official title at the Talent Campus. Aptly, it’s “Experts”. 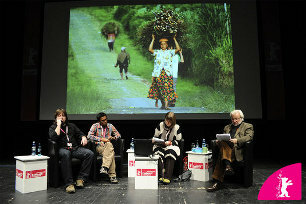 As one of the world’s pre-eminent festivals, the Berlinale brings an annual influx of top-rung film professionals into Berlin. The Campus program seeks to harness this sudden concentration of knowledge, this year offering sessions with Experts like Tilda Swinton, Willem Dafoe, Stephen Frears, Tom Tykwer and Janusz Kaminski, to name just a few. Filmmaking is a collaborative medium and the Talents and Experts come from all its professions – from producers and actors, to production designers and composers. 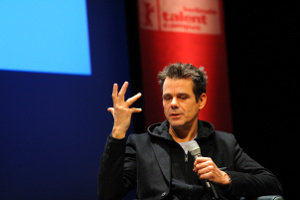 Director Tom Tykwer, whose film The International opened the 2009 Berlinale, is telling an audience at HAU1 why it is important to him to be “at ease” with not being available as a lone director for hire. The people that I work with are also my friends… and that communication is the biggest gift in my life. It’s lovely now… to see where we can still go [with filmmaking] where we have not been. If you approach me, I’m not like a spice, to put into a pot with all the other spices that you think are nice. I am the full meal. I bring the cinematographer, the editor… the whole family, as I call it. And I insist on that. Professional producers know about this and accept it and actually like it. A lot of people in my class were international so they just went home and in London it’s kind of hard to meet people… 95% of all my jobs I’ve gotten through people I know… so that’s why I’ve really enjoyed coming here. I really love travelling and I love shooting abroad so the fact that there are so many international people here is really amazing. I’ve met a girl from Istanbul who … might have a project and liked my reel and we’re kind of good friends now. I can’t say a bad word about the Campus – it’s just been fantastic…. … thinks it’s necessary to invite the entire world to a film festival like the Berlinale, especially young and up and coming filmmakers and also… to create a world-wide community for young filmmakers. … open the minds of these international talents to work together. …For many of them this is the first look into how to cooperate… and, on the other side, it’s very nice to see how easy it is to work on this level. The biggest challenge for every filmmaker is to see that ‘the work [or] story I have in mind is the right one and I need this backing from a group of people.’ The Talent Campus could be one step in the right direction. The Talent Campus actively sets out to create an environment in which connections can be made, away from the usual obstacles filmmakers face in their normal environments, and between a diverse international group who may not otherwise have the opportunity to meet each other. Alongside masterclasses, excursions and workshops, there are networking events such as the “Dine and Shine” dinner, where Talents share tables with established industry figures; and daily breakfasts hosted by different film organisations. Outside of the structured program, meeting spaces and cafes at the HAU venues provide a further hub of activity. In the bustling HAU2 café, Finnish screenwriter Erikka Rahikainen tells me she’s found the atmosphere “very friendly. I have been sitting here nearly every day eating my lunch and meeting new people sitting next to me.” Potsdamer Platz, the Berlinale’s focal point, is just up the road. 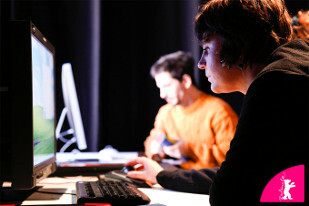 In all three HAUs, computer stations enable access to the Talent Campus database. Here, participants post details of themselves, their projects and collaborators or funding they are seeking. Accessible online year-round, the database now connects 7 years worth of Talent Campus alumni. Turning from the screen to his three companions, the editor asks, “What do you think?” One shapes an ellipsis with his hands. He thinks the cut should be shorter. Another frowns. “It works for the continuity,” he says, “but not the emotion.” They turn back to the screen, to see what can be done. I’m eavesdropping on their conversation in the HAU3, a classic Berlin apartment block converted into theatre and studio spaces. This editing suite occupies one corner of a large, darkened space filled with the hum of high-end equipment and a steady buzz of conversation. Looking across the room, I see two men chatting while dismounting a serious-looking camera from a tripod, people busy around effects suites, a colour grading desk and projection screen and others holding a meeting around a large table. In addition to the main Campus program, around 60 of the Talents join exclusive “Hands-On” programs, where they work with Expert mentors on projects ranging from screenplays and documentary treatments to editing and film scores. Here, the Campus’ goals of sharing expert knowledge with up-and-comers and encouraging collaboration manifest in concrete form. The practitioners that we offer this course to – most of them are working by themselves… they are very talented but they pretty much do everything… they go out with a video camera, they edit, they do post production, they do sound… Sometimes, of course, the teams are a bit bigger but in general we see more and more these microteams. I think it’s a very important part of our time to teach traditional filmmaking ethics of working together in a team [and] experiencing different processes… Its not that much about what comes out of it, it’s really the experience of working in a collaborative environment. That’s what we are helping the talents to achieve. The film industry collapsed after communism passed – we now have twenty years transition time in market economics and we don’t have much money for producing films. The film industry is bankrupt… there are so many impatient independent filmmakers out there… Now we have only one solution… we are all trying to make films using HD and new technologies. In my case it was after the tenth, twelfth, screenplay that I’d written that suddenly – it felt quite randomly – one TV station was saying “OK”. …I never really understood why it happened. This particular film project was not bad but I don’t know that it was so much better than the other things I’d done. … Chance was always important… Lola Rennt was not really a major turning point for me anymore. Each year the Talent Campus has a theme and this year it was “Turning Points”, chosen by Talent Campus Programme Manager Matthijs Wouter Knol as a nod to both the craft of cinematic storytelling and to the world we tell stories about. A turning point, says Christine Tröstrum, “can be something in storytelling – or something in your own career, hopefully for the Talents.” She also points out its relevance to the current global situation, in particular the financial crisis. Berlin itself is this year marking the 20th anniversary of a major turning point: the fall of the Berlin Wall. To engage with the world situation, to share knowledge and skills and to provide a turning point in participant’s careers – these are ambitious goals for a six-day event. But Tröstrum can list success stories – like Talents making first contact with funders and producers at networking sessions; alumni returning to the Berlinale and the European Film Market with their films and a recent survey suggesting 80% of Talent Campus alumni are still in touch with other Talents. Tröstrum stresses that the Campus’ impact is not limited to the six days of the event itself but extends through the networks it creates and further funding opportunities it offers alumni, such the annual collection of short films funded by the Berlin Today Award (this year these focused on the Berlin Wall) and the Talent Project Market, a kind of younger sibling to the European Film Market. The power of positive reinforcement is really important. I came from an environment where that kind of ideology did not exist. For the first time at the age of 22 I was told that I was good at something. Do not dismiss the power of encouragement. It’s essential. Throughout the Talent Campus program, the high-profile voices in HAU1 suggest certain universals to the experience of making films and trying to survive as a filmmaker – but also refreshing specificities, rather than a “magic formula”. This is supposed to be an alternative scene but …you feel like people are constantly judging each other. It’s very polarised into groups. If you are a part of this group then that group will never support you… I feel like something like the campus makes me go beyond those borders and look for partnerships somewhere else. I still have the people from Egypt that I can connect with but it’s not enough that we are three! It’s quite funny, the producer… who has expressed an interest [in my project] is a South African who is actually someone I’ve known for a while, I just didn’t know he is interested in documentaries right now. If I hadn’t come here I wouldn’t have been able to make that connection. We have such an international group… Saudi Arabia, Mexico, Brazil… We’ve all been laughing at the fact that writers are quite similar all over the world. We are a breed of our own! It’s great. I mean, she’s in Lima, I’m in Vancouver. That’s what interests me about doing something together because we’ve got these two different worlds and we can go back and forth and see how it affects a script, in the end. I’m excited about it. Normally the writer’s job is a very lonely one, so we try and create a peer support group, a community where they can get definite feedback without it costing any money because they’re all doing it for one another. This is the challenge for me as a filmmaker: to know what my funders want and to still say my story…. Also in general when you see for a very long time certain kinds of films being made about the region, people from the region start making films that way… It’s up to you if [as a filmmaker from the region] you want to be aware of it…. but I will not make a film to exoticise or sensationalise the hijab or suicide bombers because it’s a lot more complex than that. Living in the region where I live, it’s a lot more complex. It was really interesting lifting the bonnet on other people’s projects and looking at what other people are trying to make around the world. In the UK [the documentary industry] is very focused towards TV so it was nice to see that people are trying to make interesting, sort of experimental documentaries in other parts of the world and to feel that that might be possible. They are great… they are like poets, more or less. It’s not all about business and stuff. It’s really inspiring to meet them and talk about their projects. England is very commercial sometimes, you go to networking events and you feel like you are in a banker’s meeting because everyone is talking about money and in half an hour you have to leave because you can’t bear it any more. This week was just amazing. Of course we talked about money [as well] but we talked mostly about content and films. The difficulty of retaining a creative vision in the face of market demands is on the mind of nearly every Talent I speak to. This ever-present question has an interesting presence at the Campus. In some respects the event seems to provide time and space that isn’t commercially oriented, allowing filmmakers to meet each other in a non-competitive environment. For those who get a place, the Campus is free, providing accommodation in Berlin and even contributing to many participants’ travel expenses. These things said, the program is by no means in a bubble separated from the economics of filmmaking. Many sessions tackle the subject head-on, focusing on pitching skills, financing, markets and networking. Overall, it seems the Campus provides a welcome chance to step outside the familiar structures of one’s usual context – with their familiar obstacles – and focus instead on possibilities. Bjorn Maes is an Artistic Coordinator at Africalia, a Belgium-based organisation that funds documentaries about contemporary artists in a number of Southern African countries. He’s addressing Talents in an intimate space in the HAU3. The session, called It’s the Mission That Matters, is an introduction to some funding sources outside of the usual markets. The speakers here are from organisations whose aims include regional capacity-building, awareness-raising around certain issues, or preserving and encouraging culture in places where resources may be scant. to reinforce the value of cross-border collaboration and participation so that, when these challenges come, they are protected… you cannot just withdraw into a national unit and say… we don’t want to work with anyone else. Making documentaries, especially in South Africa, or Africa – the funding is always a difficulty but now with the recession it’s even worse. …There’s never a shortage of stories but the means to make those stories happen is always a difficulty. That’s an ongoing challenge. [The Talent Campus] is fantastic. Especially coming from a place like South Africa, I mean there’s no other way I could have been able to come to the Berlinale. The whole point of it is to give you a head start and I feel like I’ve gotten that head start. I’ve made connections with people from all these different countries and we’ve been making plans. [It’s] a once in a lifetime experience… it was amazing, all these people and all these perspectives. There are a lot of doors opening now. Ok, it’s difficult but in my country it has always been difficult …we are used to dealing with that kind of situation. Maybe it is different for people from the first world today. Usually they don’t have crisis and we have crisis all the time. This is really investing in people, really investing in talent… I think it’s a really smart move on the organiser’s part because they know that these people are going to come back and make films… and I’m indebted. It’s great. Where the Berlinale celebrates the end products of the global film industry – the films – and the European Film Market focuses on financing film production and distribution, the Talent Campus section acknowledges what the industry needs aside from capital to ensure its ongoing existence and health. Collaboration, knowledge-sharing, accelerating connections between people and investing in talent and skills are economic ideas as well as social ones. Film in particular is dependent on collaboration and (often informal) networks for its very existence. It also depends on talent and expertise and, while there is a wealth of knowledge out there, for new professionals especially access to this can be difficult. Many talented people achieve a degree of success and then fall into gaps between shorts and features, first and second films, study and industry or micro-teams and larger teams. The mechanisms of film markets – the path to an audience – can also be obscure. The Campus fosters collaboration and connections and encourages the movement of knowledge. It looks at existing markets and opportunities at the same time as exploring alternative markets and the creation of opportunities that don’t yet exist. In what seems an economically canny move in itself it seeks to create all these possibilities off the back of an existing resource – the Berlinale – and does so with an eye on creating longer term outcomes from a short term event. In theory, the benefits should flow back; with Talents returning to the festival with films or, for sponsors like MEDIA or Berlin-Brandenburg, bringing projects, skills and talent into their industries. All this is interesting in the current economic climate: when faith in self-feeding markets increasingly divorced from anything tangible is being questioned; where there seems to be renewed interest in economics with a social dimension; and where, as the idea of maximising short-term profits regardless of long-term cost loses standing, interest in slower-burning investments in projects with concrete human outcomes could increase. The Talent section changes the whole festival somewhat, it makes it a more friendly, forgiving environment. It’s not about the package or the more superficial aspects of selling. It gives it more depth. Kate Matthews has spent a lot of time lately riding a bicycle around Berlin. At other times, she can be found in Melbourne, working on film and animation projects, teaching and writing. She is currently a Curator for Australian Screen.